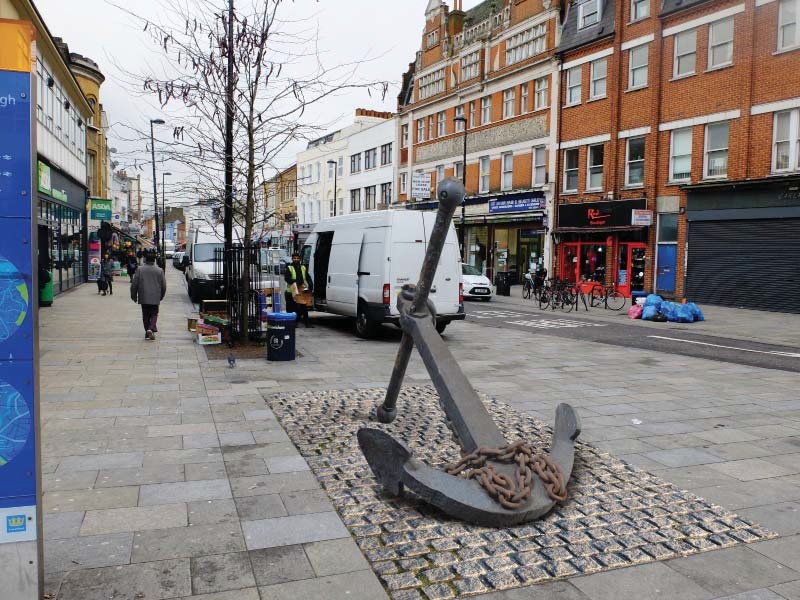 A report into the feasibility of returning the anchor to Deptford High Street has recommended it be returned to the south end of the high street. 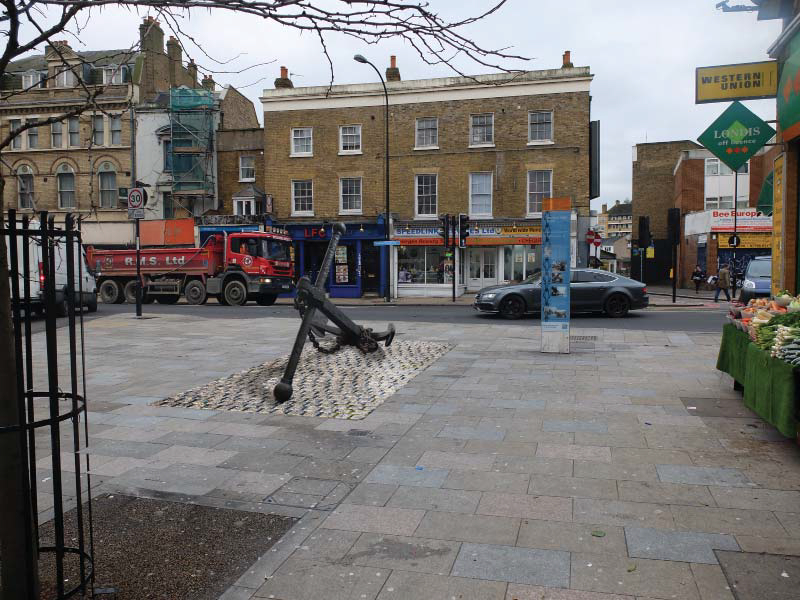 The report by consultant BDP was commissioned by the council following continued pressure from Deptford residents and local groups, and the 'Give us back our bloomin' anchor!' 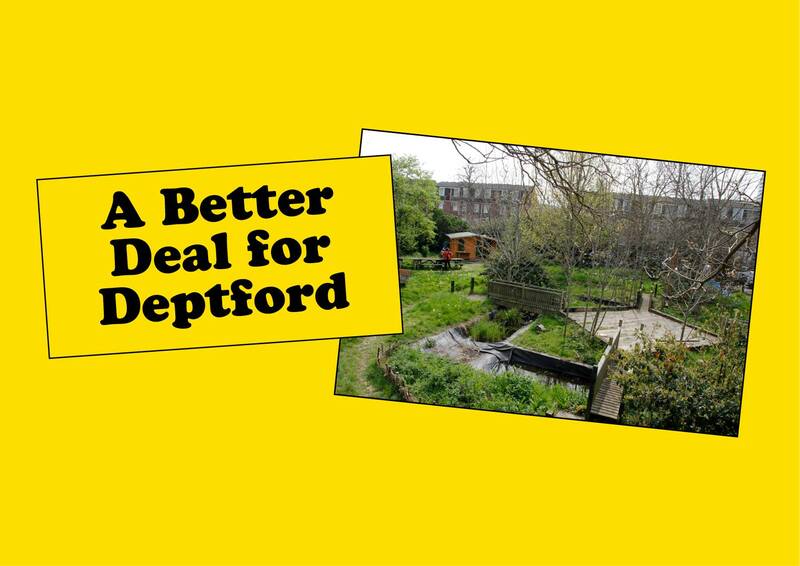 petition by Deptford Is Forever/Deptford Society which attracted more than 4,000 signatures. The cost of returning the anchor - which is currently being stored in a shed in Convoys Wharf - is estimated by the report to be approximately £24k. 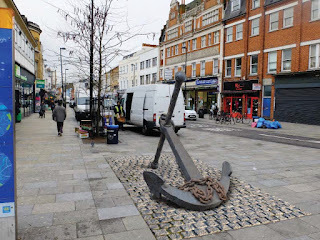 This would include cleaning the anchor (which since being put in 'secure' storage now has graffiti on it ) and creating an area of contrasting paving around it to prevent visually-impaired people from walking into it. The BDP report considers other options for relocating the anchor, including Giffin Square, but concludes that the south end of the high street is the most feasible. The report comes before the mayor and cabinet meeting next Wednesday. Council officers have recommended agreement to the return of the anchor; they also suggest that crowd funding be used to raise at least some of the cost of doing so. 28 Deptford High Street - no time to lose! Three years on from the initial proposal that 28 Deptford High Street (the former Law Centre) should be refurbished and made available for 'community use', prospective tenants are being given just a few weeks to put forward business plans and bid to take over the space. The funding which has been used to refurbish the shop has come via a rather convoluted route from the Outer London Fund money that was awarded for improvements to the south end of the high street five years ago. 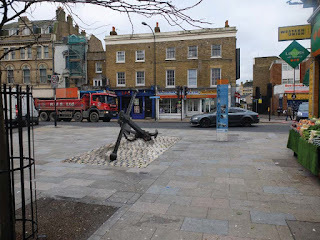 Although the high street refurbishment works and repaving were finished some years back, the cost of the work was less than had originally been predicted, and the council applied to redirect the remaining GLA grant money for other uses in Deptford, rather than having to hand it back. The option of redeploying the train carriage in Douglas Way next to the Albany was explored, but this fell through and the money was subsequently redirected to 28 Deptford High Street. The building is owned by Lewisham Council and has been closed for umpteen years now. As well as bringing the ground floor shop unit back into use, the council proposed to convert the upper floors into self-contained flats that could be rented out. The shop would be let at a peppercorn rent for a set number of years to a tenant who would 'continue the work to animate the high street through a programme of changing offers in the shop'. That plan was originally mooted in 2014. Since then, the shop has lain empty, despite being advertised for rent in 2015. Enquiries by local artists wanting to use it to display their work during Deptford X were thwarted by council red tape and demands for unreasonable rent, suggesting that the desire to 'animate the high street' was not a serious one. Fast forward to 2017 and all of a sudden there's a sense of urgency with the council looking for 'social entrepreneurs, community and cultural organisations' to take on a short-term lease in the shop. Potential bidders are being given just a month to draft and submit expressions of interest - although you don't even get to see inside the shop until ten days before the deadline, and viewings are by appointment on two specific days only. There's a lot of work to do for the first phase, including business plan, budget, details of tenant team staff, etc and if you get shortlisted, you'll be expected to have your detailed submission ready within 12 days of being notified. There is an unholy urgency going on to get someone in there that belies the past three years' sloth. I very much doubt that community or cultural organisations have the resources to come up with detailed submissions that meet these criteria at the drop of a hat, often being staffed by volunteers who do it in their spare time. Even social entrepreneurs may struggle if they are small organisations that already have a full workload - and will they want to take on another commitment in any case? It's down to the bidder to suggest what rent they are prepared to pay, so business plans will need to be realistic and thoroughly researched rather than 'back of the fag packet' style. The expression of interest form states that the council is not looking simply at income - they aren't necessarily going for highest bid. But it's questionable whether they will get a the range of offers they would like, if they are wedded to such a short timescale. Updated: Don't give up the day job just yet, it seems someone's for the high jump as the first application form significantly overstated the artist's fee. The commission has now been announced on the Tideway Tunnel site with the correct file linked, stating the much more modest artist's fee of £27k. A widely-publicised call for artists to design hoardings to go around the Thames Tideway work site on Crossfields Street in Deptford was issued last year. The chosen artist for the commission, submissions for which closed last month, will be working with pupils from St Joseph's RC primary school, which is right next to the site. But it seems that Tideway is also looking to commission a much more significant piece of work for the site, which will be permanent and could include seating and other public realm improvements, as well as sculptural elements. The commission is one of a number which are intended to be installed across the whole tideway route, as set out in Tideway's public arts strategy. Proposals and designs are expected to engage audiences in different ways; creating pleasure, celebrating people or places, being provocative, engaging audiences in new ways of experiencing or thinking about a place. We welcome applications from artists working in all disciplines, though given the nature of commissions we require prior experience of working at scale and in three dimensions. We especially encourage applications from artists who are based in London Borough of Lewisham or with a good knowledge of the Deptford area." The only place I was able to find the invitation for the commission, the total fee for which is £47k, was on the website of Lewisham Education Arts Network. There does not seem to be any wider publicity of this commission, a fact I found very odd considering the size of the commission and its significance to Deptford. Deadline for applications is 2 April 2017 so potential bidders need to get their skates on. If' you're wondering why the redevelopment of the former Tidemill School on Frankham Street still hasn't started yet, you can find out more this Saturday. 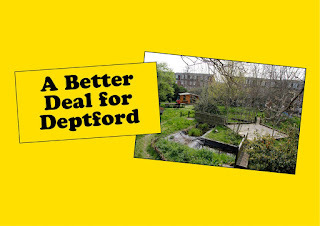 The Old Tidemill Garden will be open and will be hosting 'Stand up and support a better deal for Deptford' in collaboration with the campaigners who have been battling against the council and its developers for several years now to try and get a better outcome from the redevelopment of the site. Members of the campaign group will be in the Deptford Lounge from 11am to 3pm to explain the issues and the current situation. Concerns focus mainly on the demolition of existing social housing, lack of clarity over the 'affordable' element of the new development, the impact on residents in Frankham House and Princess Louise Building, including loss of light, and the loss of green space, mainly the community garden. 4. for the net contribution to affordable housing to be clarified. What has happened since? From what I hear on the grapevine, very little. The garden is open from 11am to 3pm, via the Reginald Road entrance. If you've not been in before, it's worth a visit and you can help clear and tidy the garden. Tools and gloves provided.